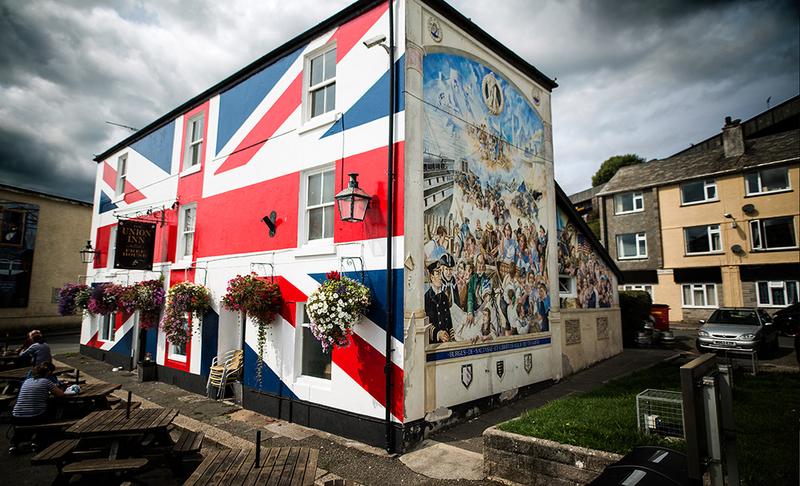 The EU Referendum result has often been characterised as a revolt of Britain’s “left-behind” towns and rural areas against the ‘metropolitan elite’. But this view diverts attention from the underlying issues which drove the Brexit vote – and ironically has diverted policy attention away from addressing them too. It’s true that a number of big urban authorities (led by London) voted to stay. And overall people living in cities were less likely to vote leave than towns. Setting aside Scottish cities and towns, which both voted very strongly for remain, Leave polled 51 per cent of the vote in English and Welsh cities, compared to 56 per cent in local authorities that include towns (consistent data isn’t available below local authority level). Yet there is a lot of variation underlying this average across towns. In Boston, 75 per cent voted Leave, and in Hartlepool and Grimsby it was 70 per cent. But at the other end of the scale, there were a number of towns that voted to stay. For example, Leave polled at 49 per cent in Horsham and Harrogate, and 46 per cent in Windsor and Hitchin. In places such as Winchester, Leamington Spa and Bath, the Leave voted amounted to less than 42 per cent of the vote. What drives this variation across towns? 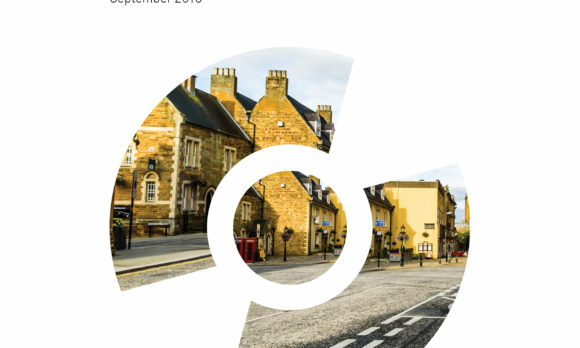 Data from our new report Talk of the Town shows economic outcomes were the biggest factor – with towns that voted Remain also having stronger economies. 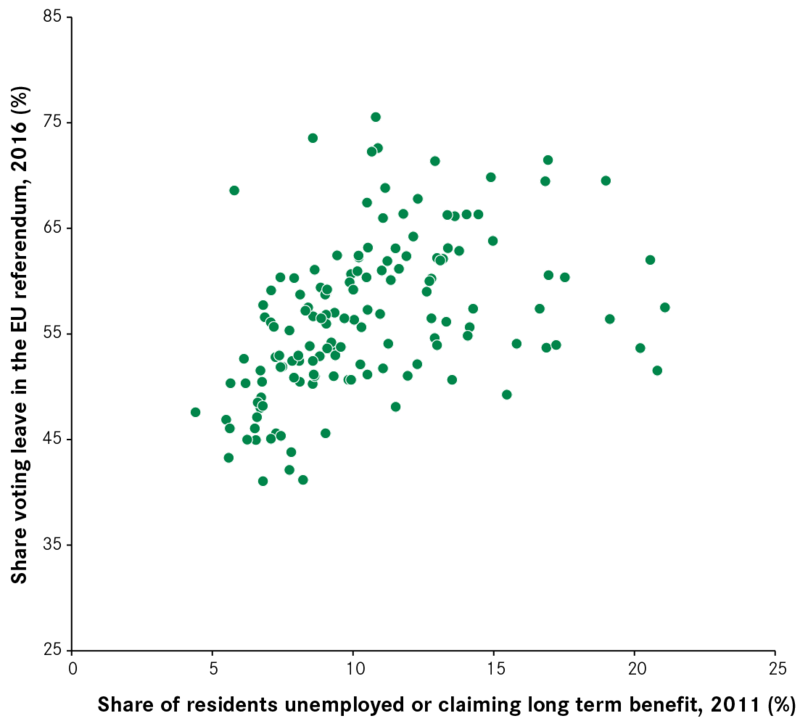 For a start, pro-Remain towns generally have smaller shares of people who were either unemployed or claiming long-term benefit (based on 2011 data, the latest available). Towns which voted Remain also had a higher share of jobs in high-skilled exporting businesses (an indication of how successful they have been at attracting and retaining high-paid job opportunities). And both measures will have been influenced by the skills of the residents in each town: the higher the share of residents with a degree, the stronger the Remain vote. So the Brexit vote was reflective of the varying economic outcomes for people in different parts of the country. Places which have responded well to changes in the national economy voted to Remain in the EU, and those that have been ‘left behind’ – be they towns or cities – were more likely to have voted to Leave. This sends a clear message to politicians about the need to improve the economic outcomes of the people that live in these towns and cities. But the irony is that the fallout from the Brexit has left no room for domestic policy, and little progress has been made on addressing the problem that, in part, is likely to have been responsible for the referendum outcome in the first place. Indeed, politicians of all stripes have seemed more concerned about jostling for position within their parties, than setting out ideas for domestic policy agenda. Most worryingly, progress on devolution – a crucial way of giving areas a greater political voice – has stalled. There has been talk in recent days of Theresa May relaunching her premiership next summer focusing on domestic policy. One of her biggest concerns should be that so many cities perform below the national average on a range of measures, and so do not make the contribution that they should to the national economy. But addressing this problem wouldn’t ignore towns – quite the opposite. What Talk of the Town shows is that the underperformance of a number of cities is bad not just for their residents or the national economy, but also for the residents in surrounding towns too. A poorly performing neighbouring city limits both the job opportunities open to its residents and impacts on nearby towns’ ability to attract-in business investment and create higher paid jobs. This isn’t the only factor – as the last chart above suggests, addressing poor skills should be central to any serious domestic policy agenda. But place has an influence on economic outcomes for people too, and policy needs recognise that different places play different roles. It also needs to reflect the importance of the relationships between places to improve the access that people across the country have to job opportunities and higher wages. The Brexit vote didn’t result from a split between cities and towns. And if we are to address the reasons for it, we need to better understand the relationship between them, rather than seeing them as opposing entities. I found your graphs very helpful. They tabulate the evidence in a way that confirms what we all know, the better off and better educated you are , the more you see Europe as a good thing. Your underlying analysis confirms the clear gulf between communities of winners ( Bath/ Winchester) and losers ( Grimsby/ Hartlepool) in support for Remaining in Europe. That fact has been evident for at least a couple of decades and its political repercussions have been crystal clear for a long time too. I am old enough to recall attempts, similar to those you are outlining , going back to the 1970s. They have generally failed. A classic example from today – two ” university campuses” , one in Stockton, one in Hastings , have been closed by their host universities because students do not want to go there. If you cannot turn the tide in Hastings in the South East , what hope is there for Hartlepool?